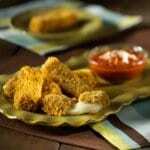 Baked Cheese Sticks | JPMA, Inc. Cheese sticks are usually deep-fat-fried. Our version bakes in the oven limiting the fat to just 6g per serving, but they still have a crispy crust and melted cheese center. Combine cereal, garlic salt, and oregano in pie plate or shallow bowl. Place flour in second pie plate or bowl. In another bowl, beat egg whites and water with fork until thoroughly combined. Cut cheese into 12 sticks approximately 2-3/4 inches long. Dip cheese in flour, then in egg mixture, then cereal mixture. Carefully repeat dipping in egg mixture and cereal mixture to double coat completely. Place on foil-lined shallow baking pan coated with cooking spray. Coat remaining cheese using same method. Lightly spray coated cheese sticks with cooking spray. Let stand about 30 minutes. Bake at 400° F for 8 minutes or until cheese is soft and sticks are lightly browned. Serve hot with pizza sauce or salsa, if desired.